Suri & Katie board their private jet en route to LA on Tuesday, 26th. Suri & Katie visited Tom on the set of "Rock of Ages" in Fort Lauderdale on Friday, 24th. 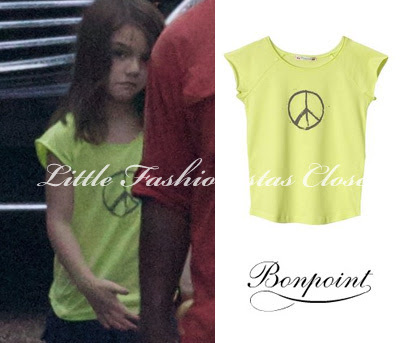 Suri was wearing Lime Peace Top SS'11 by Bonpoint. 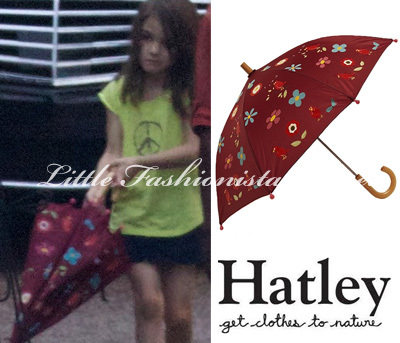 Suri was also using Birds & Flowers Umbrella by Hatley. Suri & Katie pictured leaving Miami on the private jet to visit Disney World in Orlando, Florida on Thursday, 23rd. and Tiered Voile Skirt by Cherokee/Target, which she first wore on July 21st 2010; and Butterfly Flip-flops by GAP. 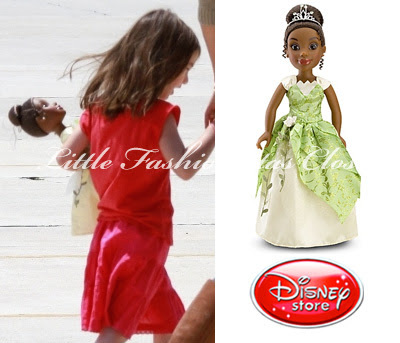 Suri is holding Tiana Princess and Me Doll by Disney store. 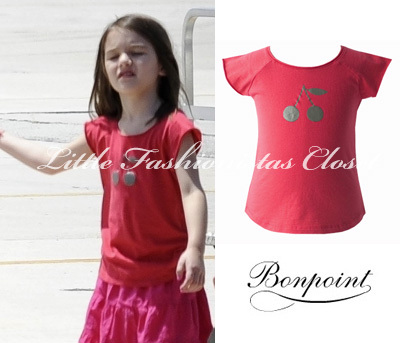 Suri & Katie went shopping to Bal Harbour stores in Florida on Tuesday, 21st. Thanks to Aninha for the pictures! and her favorite butterfly flip-flops also from GAP. 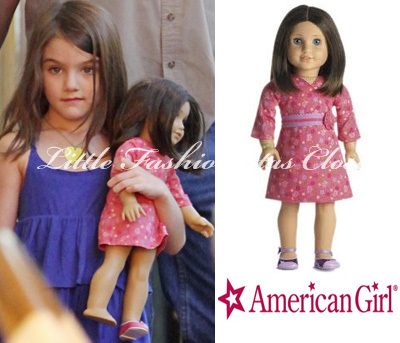 Suri is holding Chrissa Doll 2009 by American Girl. Suri was wearing Navy Dot Hello Kitty bottoms by H&M, currently on sale in-stores. 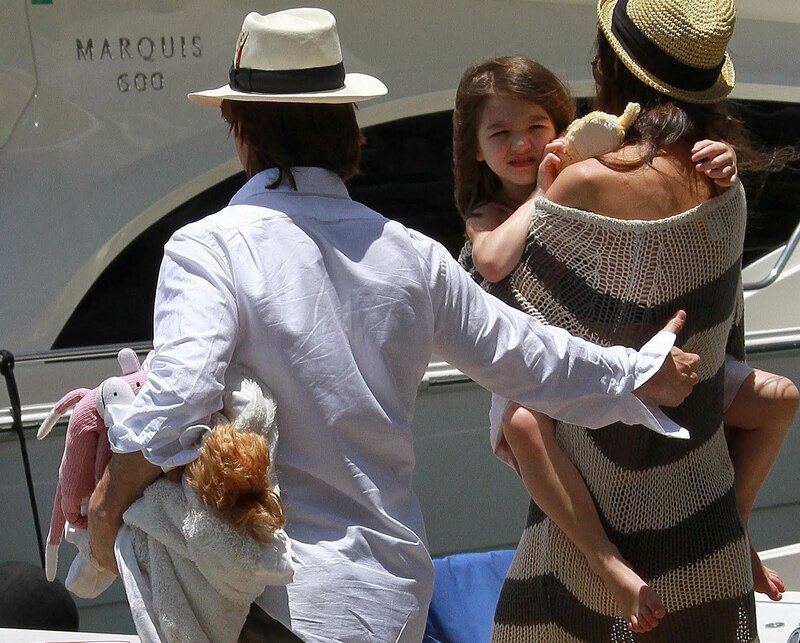 Suri celebrated Father's Day with Tom & Katie on a yacht in Miami on Sunday, 19th. Suri is wearing a Pajama Gown by Esme Loungewear. Tom was holding Suri's - Julius Knitted Pink Monkey by Paul Frank. Thanks to Mandee for the toy id! 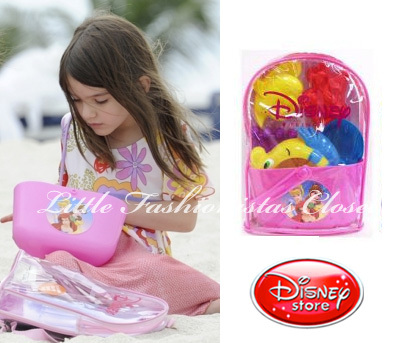 Suri was having fun at the beach and playing with Princess Sand Backpack from Disney store, available only in Canada. Thanks to Mandee for the info & stock image! 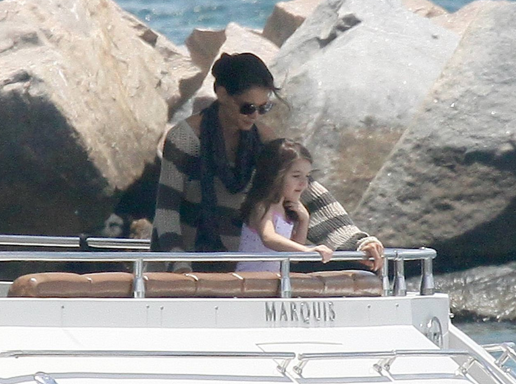 Suri & Katie enjoy their time at the beach in Miami on Saturday, 18th. 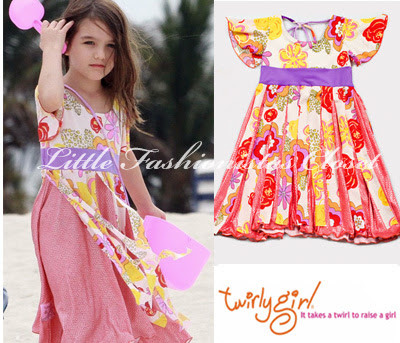 Suri is wearing Lovely Spring Dress by Twirly Girl and Butterfly Flip-flops by GAP. Thanks to Irene for the link! Suri spends time with her grandparents & Katie in Beverly Hills on Tuesday, 14th. Suri is wearing Brightella Asymmetrical Dress in Maghenta by Little Ella Moss and the same butterfly flip-flops by GAP as yesterday. 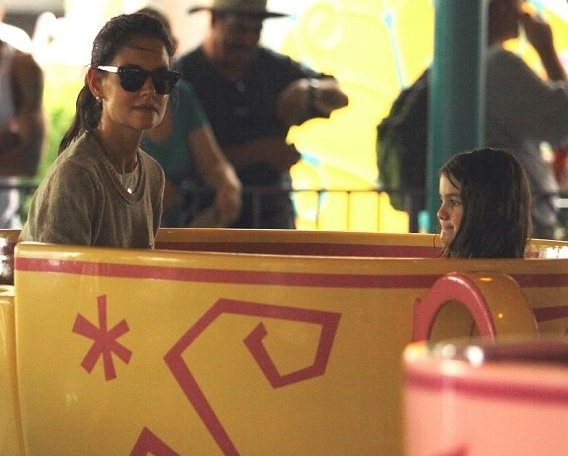 Suri & Katie headed to the Urth Cafe in Beverly Hills on Monday, 13th. 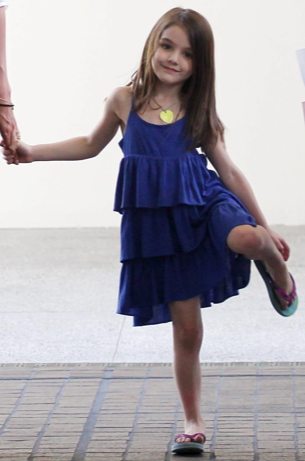 Suri is wearing Chambray Swiss Dot Dress from Pirouette line and Butterfly Flip-flops, both by GAP (sold-out online). 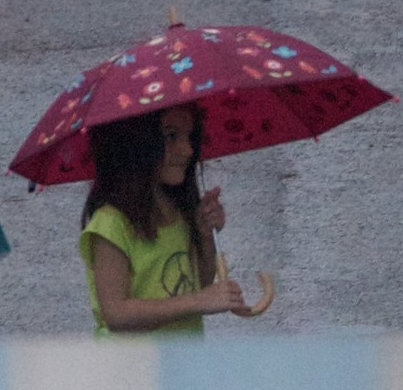 Suri was accompanied by her parents to the dance studio in LA on Sunday, 12th. Suri is wearing a set by Esme Loungewear.